Summary : A very enjoyable, smooth and moderately strong flavored pure green tea from Japan. Anyone who enjoys premium green tea will certainly like this one that is available from Culinary Teas. Review : I had a pleasant green tea tasting experience earlier today with Adagio Teas Sencha Overture Green Tea. So, in the spirit of all things green...and perhaps to simply see some green this time of year, I found myself in the mood tonight for yet another green tea. I couldn't quite stomach a flavored green tea tonight...just wasn't in the mood. Instead, I was looking for something "pure" and high-quality. And wouldn't you know it, one of the first samplers I came up with was as pure of a green tea as you are going to find. It was called Gyokuro Green Tea and is put out by Culinary Teas. 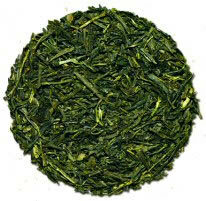 Gyokuro Green Tea, for those not familiar with it, is a premium Japanese Green Tea. It isn't the "everyday" green tea in Japan...that is Sencha Tea. Instead, Gyokuro Tea, due to it's cost, is used for more special occasions. Here is how Culinary Teas describes this tea on their website. "The bushes are shaded prior to plucking in order to increase the chlorophyll and reduce the tannin. Gyokuro is a premium Japanese green tea." As you can see, there is nothing added to this tea. It is simply pure green tea, coming from Japan in this case. And my, does the premium nature of this green tea show. The leaves are clean without a trace of dust. Once brewed, the color of the tea is exactly as it should be...a delightful pale green. And the fragrance of the tea is simply "pure green tea" with the wonderful aroma of quality green tea leaves. The flavor of this tea happily matches the premium nature of this tea. The flavor is exceptionally smooth and has absolutely no hint of grass whatsoever. What about bitterness, you ask? There is none at all...how's that. And the taste itself is relatively strong, but not so overpowering that it detracts from the pleasant flavor the tea has. In short, the taste is exactly what you expect from a quality Gyokuro Green Tea. Overall, if you love pure green teas, and especially quality Japanese green teas, you'd be remiss in passing on this tea from Culinary Teas. Being a premium green tea it is far more expensive than other standard green teas. But you know what, the taste is worth it. Recommendation : Absolutely! This is a high quality, Japanese green tea. Period. Anyone who loves quality, pure green teas should run over to Culinary Teas and pick themselves up some. Neither the fragrance nor the flavor will disappoint you. That said, if you haven't had a loose-leaf green tea before, it may be best to get a different green tea "for starters," as I've discovered people new to loose-leaf green teas tend not to like "pure green teas" until they've gotten use to other green teas first. Brewing Instructions : Use 1 teaspoon of tea leaves per cup. Pour water with a temperature of 180 degrees over leaves. Let brew for 2-3 minutes. The leaves in this tea are powerful enough that you can use them 1-2 additional times, although do expect some flavor loss if you do this.